1 Rinse and peel the asparagus, remove any woody ends and blanch for 5 minutes in salted water. Then drain, rinse cold, drain again and cut the spears into thirds. 2 Rinse the rhubarb, remove the strings and cut into 0.5 cm wide pieces (approximately 1/4 inch). Peel and finely chop the shallot. Sauté both in some oil until translucent. Dust with powdered sugar and allow to caramelize slightly. Add the thyme and deglaze with 2 tablespoons of asparagus water and vinegar. Simmer for 1-2 minutes until the rhubarb is cooked al dente, then remove from the heat and allow to cool slightly. Season with salt, pepper, honey and olive oil. 3 Rinse the arugula and shake dry. Divide between four plates and place the asparagus pieces on top. 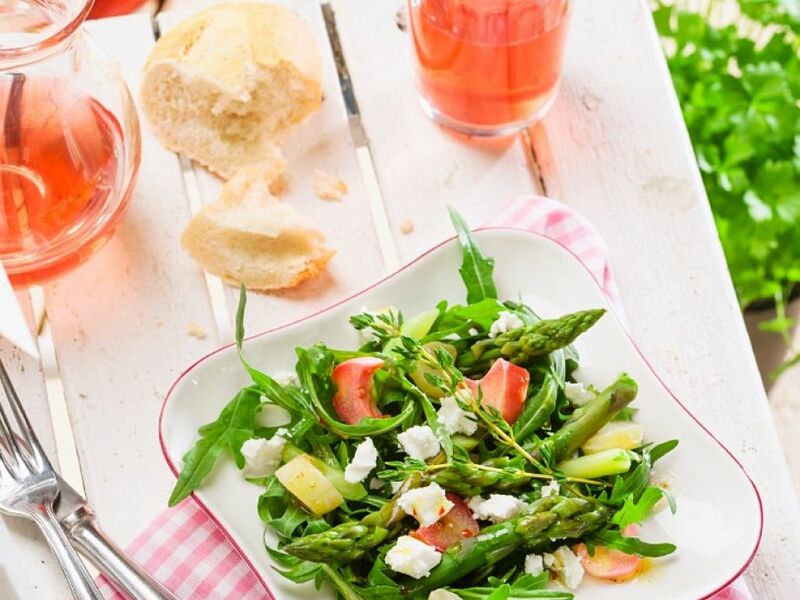 Crumble the cheese over the salad and serve drizzled with the rhubarb dressing. Serve with a fresh baguette if desired.